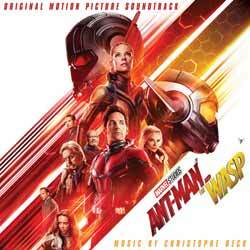 Christophe Beck delivers something a little different from the usual superhero movie score. Sure, there's the adrenaline pumping, epic themes we've come to expect, but there's more of a James Bond edge to them (David Arnold-esque). I've listened to this album quite a lot over the last few weeks and it's one score that seems to get better each time you play it through. The album contains 25 tracks (55 min, 55 sec) and there isn't a wasted minute; no bland filler material. From start to finish this is packed with interesting and attention grabbing themes. Tracks like 'Ava's Story' and 'Revivification' showcase Beck's ability to write touching, beautiful themes and 'Arthropodie' finally sees the main theme, which is touched on throughout the score, finally come into its own. This is an engaging and rewarding score that all lover's of epic soundtracks should own.